Once accepted to the Easter swap be sure to post your wishlists here! I'm not too picky, no major hair cuts, or really bad marks, no chewed on or missing limbs LOL! But little flaws or marks and such don't bother me. I like cooking/baking and decorating for the holidays. I'm not very religious so my decorations are more like bunnys, chicks, easter eggs... I love Snoopy/Peanuts, Eeyore, Garfield and I also collect Charming Tails. I have a piebald dachshund, Frank who is my fur-baby so I tend to collect dachshund stuff too. I also collect gnomes and I like mice but not Mickey, nothing against good 'ol Mickey but I just like cute mice stuff. I like fun Easter-y socks and jewelry, particularly earrings. If you're a good cook I also love to get people's tried and true recipes! My full wishlist is in my signature. 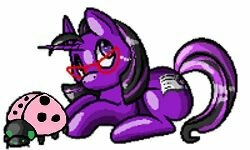 I have a collection of just purple ponies and more unique, factory error, or customs are always welcome. Our most favorite Easter candies are Cadbury mini eggs and Greece's peanut butter eggs, my daughter has a small collection of decorative eggs from different countries, and we always love a beautiful rock/mineral polished into an egg shape. We bake lots, so cookie cutters and sprinkles are always fun. Plus, chicks are just cute. My two most desired ponies right now are mo sparkle pony twinkler, and mo sparkle pony sunspot(with pink hair). A little about condition. I like pretty ponies. Haircuts, cancer, chewing marks, marker except on bottoms of hooves, major symbol rubs, missing g2 eye gems, and head/body mismatch aren't my cup of tea. A little frizz, dirt, scuffs, and light rubs are ok. They just show the pony was well loved. I Love g1's first and foremost. I like purple, green, pink, sparkles, long hair and bright vivid color combinations. We do have some mib/moc g3 and g4. My daughter is collecting with me and she likes, erasers, colored pencils, emojis, and puppies. Stone, metal, wood, glass, ceramic, or tins with advertising. Small decorative, containers, plates, and bowls, buttons, old glass bottles without labels, and anything schipperke related. Plastics (prolonged exposure), lotions, scents with any chemical, oils, perfumes, and most jewelry. The only goodies I don't like are sour, black licorice, anything coffee even a tiny bit, and cilantro. Lilac, almond, honey, light vanilla, gardenia, peony, sweet elisia, and honeysuckle. Any of them too strong or with a chemical background are a no. Key chains, magnets, notebooks, stickers, national monument posters or other art (I like key chains and magnets of local landmarks, too), gel pens, adult coloring books, decorative pins. I have a schipperke (my avatar is a picture of one) and and he loves soft stuffed toys, and soft real chicken treats. He isn't allowed to have any rope, nylabone, rawhide, hooves, pig ears, or anything besides dental bones unless it's soft or a dehydrated muscle. I am trying out my first Ostara this year I do easter with my family as well but I am excited to try Ostara not sure how to do it with egypitan theme but there always a learning curve. I like White Chocolate no nuts. Iono if this could work into easter but I love Unicorns. Mass Effect all of them. Thing that smell I am allergic to a lot of stuff. As for ponies they much come from a smoke free home due to my health. Cancer if bad I have to say non to due to allergies. I am looking for the 35th in box Minty as well just came out. I'd love at least one G1. My favorite animals are land/pond turtles. My favorite colors are white, green, and red. I don't like pink. I am also a big fan of Peanuts ~ Snoopy in particular. I also love disney stuff, especially tsums tsums (the small ones). Favourite characters are Winnie the Pooh, Mickey and Minnie, Aristocats, Alice in Wonderland. I like stickers, stationary items such as pens, pencils, notepads, post its or fridge magnets, shopping bags. I love lip balms and I like homemade items and art. I like milk chocolate, white chocolate, marshmallow and gummy sweets and laffy taffy. I would like to receive some Easter themed sweet treats local to you. I like drinking coffee and hot cocoa especially topped with marshmallows!